There is growing scientific interest, practical need, and substantial support for understanding urban and urbanising areas in terms of their long-term social and ecological trajectories: past, present, and future. 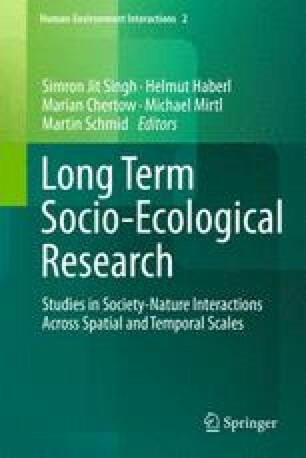 Long-term social-ecological research (LTSER) platforms and programmes in urban areas are needed to meet these interests and needs. We describe our experiences as a point of reference for other ecologists and social scientists embarking on or consolidating LTSER research in hopes of sharing what we have learned and stimulating comparisons and collaborations in urban, agricultural, and forested systems. Our experiences emerge from work with two urban LTSERs: the Baltimore Ecosystem Study (BES) and the District of Columbia-Baltimore City Urban Long-Term Ecological Research Area-Exploratory DC-BC ULTRA-Ex project. We use the architectural metaphor of constructing and maintaining a building to frame the description of our experience with these two urban LTSERs. Considering each project to be represented as a building gives the following structure to the chapter: (1) building site context; (2) building structure; and (3) building process and maintenance. This material is based on work supported by the USDA Forest Service Northern Research Station and the National Science Foundation under DEB 1027188 (Baltimore Ecosystem Study) and DEB 0948947 (Washington D.C./Baltimore ULTRA-Ex). We gratefully acknowledge additional support from the Center for Urban Environmental Research and Education (CUERE) at the University of Maryland, Baltimore County and Georgetown University. Partnerships with the US Geological Survey, the City of Baltimore Department of Public Works and Department of Recreation and Parks, the Baltimore County Department of Environmental Protection and Resource Management and Department of Recreation and Parks, the Maryland Department of Natural Resources, Forest Service, The Parks & People Foundation, and the Casey Trees Foundation have been instrumental in the lessons reported here. We are grateful to our colleagues at these institutions for their intellectual contributions and insights into the environment and environmental management in the Baltimore region. We would like to thank Cherie L. Fisher, Jarlath O’Neil-Dunne, Chris Boone and Gary Machlis for their assistance with figures for this chapter and helpful suggestions from Chris Boone, Dan Childers and two anonymous reviewers.